Can Pirates and Mermaids Be Crusaders for Disability Rights? It always happens. I’m introducing someone to the Longmore Institute’s mission to flip thinking about disabled people by challenging what everyone takes for granted. Invariably, there comes a moment when I know I need help that can only come from the high seas. 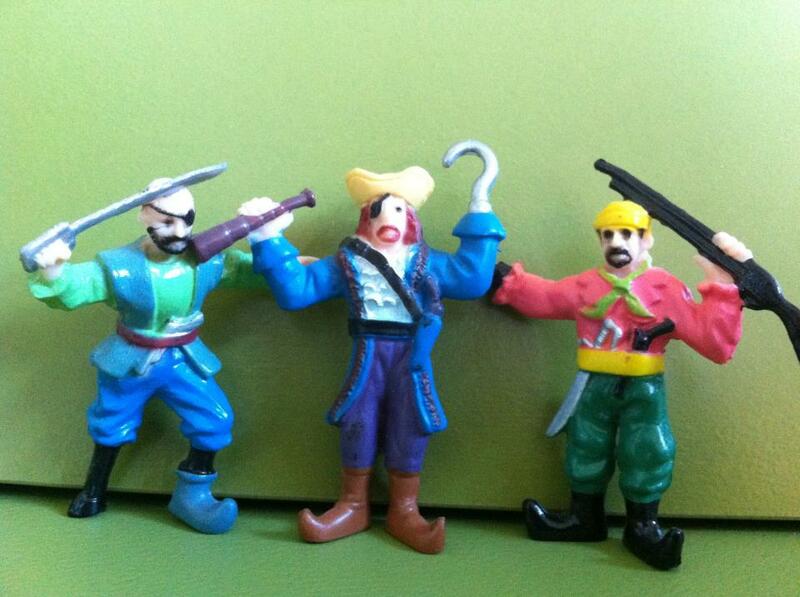 So I pull out my Longmore Institute mascots, three plastic pirates that are about two inches tall and line them up on the table or pass them around the room. They’re dressed in bright colors, arms extended, ready to pounce. One has a rifle in one hand and a hook for the other hand; another one with an eye patch and wearing a waist-coat holds a spyglass in his non-hooked hand; a third, also with eye patch and hook, wields a sword. “What are these?” I ask. Indeed, what about the mermaids! Who knew to think of a graceful woman with a single fin instead of two legs as having a disability! I’m ecstatic because now the questions and curiosity have taken on a life of their own. In a split second something that always seemed obvious and self-evident has been turned upside down, and now everything might just be up for grabs. But given all that needs to be done to improve the lives of people with disabilities, do pirates and mermaids really matter? As director of the Longmore Institute, I wrestle with competing imperatives in the struggle for disability rights. On one side is the need to fight for a base line of accessible, affordable housing, quality healthcare, reliable, adequately-compensated attendant care, better education and higher graduation rates, improved job prospects and working conditions. On the other is the struggle to change hearts and minds, to offer the tools, the ideas, the stuff to combat internalized shame and the external prejudice and low expectations that constantly undercut people with disabilities in ways large and small. Enter the pirates and the mermaids. Probably they won’t be much help with the base line, daily life stuff, frivolous, cute, not the real struggle. And yet…. Imagine the person growing up with a disability thinking not just about the Tiny Tims, but about a life full of risks, adventure, danger, and power. Imagine potential employers or employees who grew up thinking of mermaids as elegant swimmers able to go places where no one else can or of pirates as gutsy and resourceful. A generation of disabled people who carry around pirates and mermaids might help change not just hearts and minds but also the dismal employment statistics for people with disabilities. Journalists, editors, film-makers, novelists, publishers who have held a pirate as he transformed from adventurous renegade to disability action figure will be more likely to provide a wider variety of portraits and stories which in turn will influence healthcare providers, teachers, expecting parents, kids on the playground, aging baby boomers, returning vets, and most likely others. Politicians, CEOs, policy wonks, judges, and anyone who has encountered images of disabled people outside the tired old stereotypes will be more likely to introduce and support legislation, allot funds, and champion initiatives that benefit the lives of disabled people. A stronger case needs to be made for the essential role culture plays in improving the lives of people with disabilities. Too often our society views small things like pirates and mermaids as insignificant or luxurious, when in fact they represent a key, often unguarded, entry point into changing attitudes that pave the way for the big stuff like employment, housing, and better services. Consider the recent excitement over creating toys that will inspire girls to become engineers. Here’s to a future where kids with disabilities dream up new ideas, including lady pirates, gentleman mermaids, and many other colors in the adventure rainbow.